Back to preserving today. 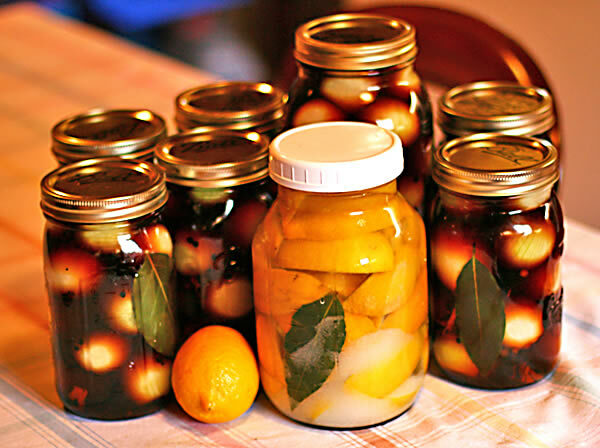 There are lots of small onions about now, so I have been happily laying down 4 kilogram of them to pickles, plus I have been preserving some lemons in salt – they will keep up to 2 years and are perfect for sauces etc. when you need lemon peel. Take your unwaxed lemons and scrub their skins well. Divide into quarters. Pack the lemons into a glass jar with a glass lid (I don’t have any right now so will need to repack them when I can get some in) so the salt does not corrode the lid. As you are layering the lemon quarters in, spoon in generous quantities of salt over each layer of lemon. You can also add bay leaves if you like. Once the lemons are packed in salt, fill with water, close the jar and shake it to dissolve the salt. If you can dissolve all the salt, you haven’t added enough salt, so tip some more in – there should always be a layer of salt visible at the bottom of the jar (you can see it in the photo). Each day for two weeks, shake the jar and if all the salt dissolves, add some more. Store in a cool, dark place for up to two years. This recipe takes 2 days. Put a pan of water on the hob and heat until it is simmering. In a big china or glass bowl, mix 250 gram of salt with about 300 ml of boiling water, dissolve all the salt in the water, then add a further 1.2 litres of cool water. Stir. Taking the onions at about 6 at a time, pop them into the simmering hot water for a slow count of 20, take them out, then peel them. (The hot water loosens the skins, but don’t leave them in there too long or they will start to cook.) I do them 6 at a time because it means they haven’t had time to cool down much by the time I get to the sixth and the skin will still slip off easily. The hot water means you won’t get much onion aroma, either, so your eyes won’t water. After you have peeled your onion, pop it into the bowl with the brine (salt water). Once all the onions are in the brine, weight them down with a couple of plates (you need to submerge the onions and they will want to float because of the heavily salted water). Leave 24 hours. In a saucepan, gently warm the vinegar and the spices. You do not need to boil it, just warm it. Take off the heat. Rinse and dry all the onions. Pack your onions tightly into sterlised, but cold jar, and fill with the vinegar solution, making sure each jar has its fair share of spices in it (I generally add a few more to each jar). Add more bay leaves and the dried chilli to the jars if you wish. Make sure the vinegar solution is covering all the onions – recheck in a day or so and if needed top up with some more malt vinegar. Store somewhere dark and cool for at least a month. They will keep for a year at least. I am trying to decide if I want to go plant some beans, or eat. Maybe I will put some food in the oven and plant beans while it cooks. Next post Oh, that wind …..
OMG I LURVE preserved lemons ..I will check out the market on the coming weekend …must hunt up some jars…thanks for the reminder ..
Now tell me more about rhubarb champagne ..is this some devious plan to justify yet another bottle or two of champagne??? Or your version of pea-pod wine from the Good Life??? oh you reminded me lemon butter, yes I know you preserved them but lemon butter I loved it as a kid on brown toast.Oh I need to make that ,thanks for the memory.BTW your preserves look lovely but I don’t think I would use enough of them to justify it.Can you use the lemon too or just the rind? Thanks for the lemon recipe. i’ve tried the glass lids and they just kept popping open. No idea why. Old coffee jars. Old coffee jars possibly don’t have very good seals. Sara, did your lemons end up getting a mold layer across the top? I did them last year and mine did/have (I still have some). A friend suggested just removing the mold and they should be ok….I’m not sure about that though!